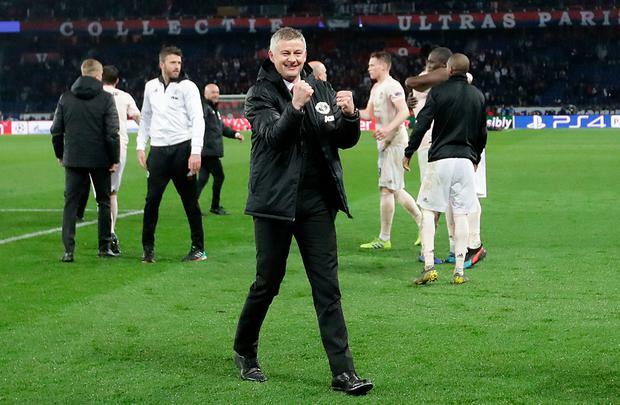 Luke Shaw is "certain" caretaker manager Ole Gunnar Solskjaer will get the Manchester United job on a permanent basis after overseeing a historic Champions League win at Paris St Germain. No side had ever overcome a two-goal home loss and progressed from a knockout match in the competition's history, but United wound back the years to seal a memorable triumph in the French capital. Romelu Lukaku scored twice in a frantic first half, although Juan Bernat's effort meant Solskjaer's side had to score one more away goal to progress. Just as hope of a first quarter-final appearance since 2014 began to fade, the video assistant referee intervened and referee Damir Skomina pointed to the spot after adjudging Presnel Kimpembe guilty of handball at the death. Ice-cool Marcus Rashford smashed home his first penalty for the club to send all connected with United wild and surely secure Solskjaer the permanent job after his 14th win in 17 matches. The players were chanting the manager's name in the dressing room after the match and Shaw believes it is a case of when rather than if the Norwegian becomes Jose Mourinho's permanent successor. "I don't think I need to say much after all these results, it looks certain," the United left-back said. ✍️ How long would you like on your contract? 💷 What do you want your salary to be? "We all love Ole and we love the job he's done so far. We're enjoying everything that's going on at the moment and the results have shown that. "We've had a couple of blips but that's nine away matches (won in a row) now, they're not easy games, but it shows what sort of job Ole and his staff have done. United striker Lukaku echoed Shaw's sentiments by saying Solskjaer is "going to stay, there's no doubt about that", before asking: "What else does he have to do?" Skipper Ashley Young went out to film the travelling hordes singing "Ole's at the wheel" to the tune of the Stone Roses song 'Waterfall' after the win and has been just as impressed by the caretaker's work. "It's not down to the players to decide," the full-back said. "If you look from the outside you'd say, 'why not?' He's been fantastic since he's come in, a breath of fresh air. "The way he's gone about the job has been unbelievable. The achievements we've made in a short space of time have been fantastic. "Luckily for us as players we don't have to decide, it's down to the owners and the directors." Co-owner Avram Glazer was among those in the United dressing room after the match, joining the likes of Sir Alex Ferguson and Eric Cantona. Shaw loved celebrating with such United greats after a win that only highlights the positivity and belief instilled by 1999 treble hero Solskjaer. "I said last week I believed in the team, even with the injuries we've had," the England left-back said after a win secured without 10 first-team players. "I felt we were capable of pulling something off and even earlier today I said to Lee Grant that we were going to win, I could feel it. "But that sums up what the mood is like in the camp now and that's a big plus for the boss and what he's done in this period of time and how much he's changed things around. "We've got so much more to look forward to."